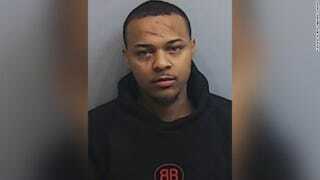 According to USA Today, rapper Bow Wow has been arrested in Atlanta following a physical confrontation with his on-and-off girlfriend, model Kiyomi Leslie. Police were called to an address in Midtown Atlanta around 4:15 a.m. When they arrived, a woman named Leslie Holden told them she’d been assaulted by Moss. Officers also spoke with Moss, who said Holden assaulted him. Police say both Moss and Holden had “visible minor injuries.” Officers couldn’t tell who was the primary aggressor, so both were charged with battery. Police say both were being processed and would be taken to the Fulton County jail. It wasn’t clear if either had an attorney who could comment. Presumably the “Growing Up Hip-Hop: Atlanta” star is in town for Super Bowl weekend, which is being hosted by his native Atlanta. Prior to his arrest, he was spotted at retired basketball star Shaquille O’Neal’s Super Bowl event, “Shaq’s Fun House”. Police say the investigation is ongoing. If Bow Wow Isn’t Black, What Is He?